If you haven’t seen the Hector Bellerin video that’s doing the rounds tonight, then stop whatever you’re doing and watch it now. The Arsenal right-back has come under fire from some quarters lately after a dip in form and some questionable remarks made about divisive fan channel Arsenal Fan TV during a speech at the Oxford Union recently. 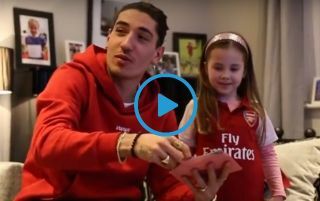 Still, there can be no doubting Bellerin’s class when it comes to those he does perceive as true, dedicated Arsenal supporters, and he made this little girl’s dream come true with a surprise visit to her home. The Spaniard explains at the start of the video below how he saw the young fan’s banner dedicated to him at the Crystal Palace game earlier this season, and he managed to get in contact with her family with a little help from others on Twitter. Arsenal fans are unsurprisingly impressed with the defender for his efforts, and he comes across as a genuinely great bloke as he hangs around with the girl and her brother in their home. Respect to Bellerin… cute video ? They play some Mario Cart, hang out in her room, take some photos and have an all-round great time – and he even gives her the match shirt he wore that day at Palace. CaughtOffside understands Bellerin has expressed a desire to try a new challenge at the end of this season, but this brilliant Bellerin video shows that, for now at least, he’s an Arsenal man through and through. Love that from Hector Bellerin. What a great guy. Awesome video ??? Imagine hating Hector Bellerin. Top top guy and a very good player.